In a soft heather colour, this light weight Marina Rinaldi sweater features an intricate jacquard pattern. We love the flattering long line cut and soft fabric. 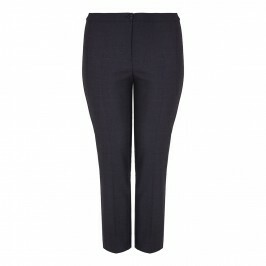 Team with tailored black trousers for a sophisticated daytime look. Lined heather jacquard sweater. Knitting Yarn: Yarn 1: 30% Alpaca, 30% Mohair, 25% Polyamide, 15% Polyester. Lining: 100% Polyamide. Cold Hand Wash or Delicate Dry Clean.